A major player in the lightweight expandable solar-powered area lighting solution has been something called the Luci Light. It was an inflatable cylinder that offered a mildly bright LED lantern for general camp situations and inner tent lighting. While the Luci Light has many drawbacks, its first-on-the-scene popularity made it the Kleenex of its inflatable lighting space. But being popular certainly doesn’t make it the best. As the only game in town for a while, the Luci Light was impressive, but now that the particular space the Luci Light popularized is getting crowded, we can ask for more. 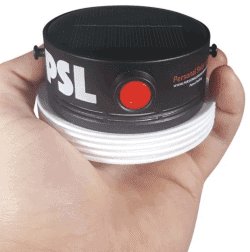 And more has certainly showed up in the form of the PSL or Personal Solar Light. I have never been a fan of solar lights. I always thought of them as a gimmick that really could not be relied on in a crunch situation. About 2 years ago, Mrs Inor got a bunch of wall mounted solar lights from an Amazon Lightning Deal. I think they were something like 4 lights for $8. I laughed at her but hung them up on the gate to our property. After 2 years and several monsoons, they are still working great. I am happy to admit, on that one, I was wrong. Without any details on the battery (size & voltage), I'm in the no-go camp. It has to be two things : Replaceable and Readily Available. Give a man an airline ticket and he'll fly for one day. Push him out of the airplane and he'll fly for the rest of his life. A few hours of sunlight can be stored in the 2000 mAh battery housing up to 30 hours of lighting runtime. It turns out the PSL battery is about the same capacity as the battery in the iPhone 7. In other words, this is a serious battery in a serious light. Might be worth giving a test run camping this summer. I have used battery operated chem lights inside my tent since my first deployment, but not having to worry about batteries could be nice. That tells me the capacity. Not whether it's replaceable and available. They have lithium ion batteries . Not exactly the best option for SHTF. I'd prefer something I can, at least, attempt a repair on. Nice option though. Always have a back up plan. I always pick up the yard lights, the ones on a stake, when I see em on sale for 10-15 bucks a dozen. Put em in the sun to charge good, then take the batteries out, usually AA or AAA, and use them in remote controls, flashlights or whatever, recharging when necessary. I have several dozen of the lights stashed away. With a little imagination the lights are good for lots of things.